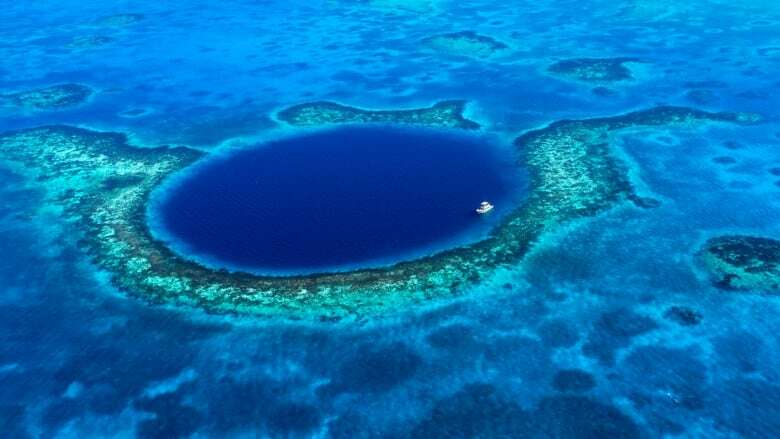 Kitchener's Deep Trekker will take a deep dive into a giant underwater sinkhole off the coast of Belize, dubbed the Blue Hole, as part of an upcoming expedition. Kitchener's underwater drone company Deep Trekker will take a deep dive into a giant underwater sinkhole off the coast of Belize, dubbed The Great Blue Hole, in an upcoming expedition. Deep Trekker partnered with Canadian company Aqautica Submarines and will join Richard Branson — the founder of Virgin Group — and Fabien Cousteau, grandson of oceanic explorer and filmmaker, Jacques Cousteau, for the expedition. The Blue Hole is one of the world's largest underwater sinkholes, measuring over 300 metres in diameter and more than 125 metres deep. The expedition, which will also includes scientists, filmmakers and other explorers, will document and share what lies at the bottom of the Great Blue Hole. "There's many species plant life that exists there, so it's an exciting thing for people to go look at," Cody Warner, sales manager for Deep Trekker told CBC News. Deep Trekker, who makes underwater drones for exploration and ocean research, will provide video and help collect data. "We've had a few of these great underwater exploration activities, but this one has a little more oomph to it," Warner said. Deep Trekker has been involved in the exploration of USS Arizona and was part of the discovery of a number of Franklin Expedition ship wrecks, he adds. Part of the expedition also aims to begin annual scientific monitoring of the Blue Hole to help protect its wildlife.